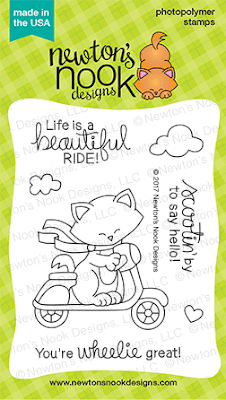 It's day 3 of the Newton's Nook May Release and all the products will be available in the store tomorrow... Yay!!! Today we are showcasing the new Newton set... Newton Scoots By and it's coordinating dies. I found these cute papers in my stash from Doodlebug that we perfect with this set. I created a top folding A2 size card base and then I added a piece or pattern paper. I die cut a Picture frame shape (I don't know the name of this die from MFT) from some White and Gray card stock. Then I adhered the two together offsetting them just a little so there was a tiny shadow. I stamped the sentiment onto a banner from the same Gray color and heat embossed it in White. Then I adhered the banner over the photo frame. I stamped the Newton and Cloud images onto some Copic friendly paper and colored it in. Then I used the coordinating die to cut them out. I created a scene for inside the photo frame area with two additional pieces of pattern paper and the Land borders Die set. I assembled the background and added Newton and then I added some foam tape to the back of the frame and adhered it to the card front. I wanted a little sparkler so I added some clear Wink of Stella to the scooter and some Sparkling Clear Sequins from Pretty Pink Posh. Comment on the NND blog and Design Team blogs (see list below)! The winner will be chosen at random from the collective reveal posts. Make sure to check out each of their blogs and comment for your chance to win. You will not know which blog has been chosen so the more you comment on the better your chances are of winning! You have until Thursday May 11th at 9pm CST to comment -- winners will be announced on the blog post on Friday, May 12th. Your card is so precious and love the scooter paper. I can't believe you found that matching paper. Really cute card! Great card, this is so cute. You did an awesome job on this card. I think it is pure talent to even think of coming up with this design. Love this stamp set, and would love to have it. Thank you for sharing your design and talent. I love your card it is adorable. The paper with the scooters is so cute. Oh this is tooo cute!!! Love your design!! I love that you did a softer palette. It's such a cute card. The patterned paper is wonderful. Very pretty. I like the framing and the colors. Very cute polaroid of Newton zipping along on his cute scooter! I love the way you mixed the pattern papers in and the fun pink scooter! Such a sweet and adorable card! Very fun card! Love the new Newton set! These papers are perfect! Darling layout! Very sweet card and lovely coloring! Amazing you had the perfect coordinating paper for the scooter! This set is so cute and I love that you colored it PINK!!! I just love your card. I love how you used the polaroid frame to frame in the image and the pink scooter...love it! Such a cute card. Really really love this and that pretty background paper! Wheelie gr8!!! Love ur beautiful LO! I'm loving the sentiments...I use a scooter wheelchair. I *need* this set!